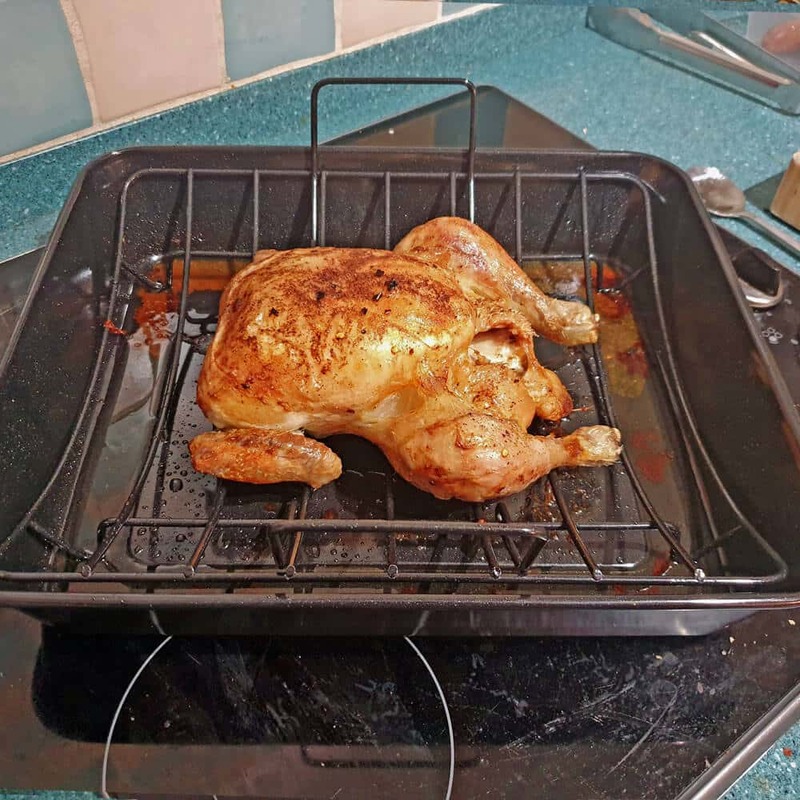 I don’t need to be asked twice to roast a chicken, so when I saw this new Oven Roaster, it had to be done. This massive roaster comes with a rack, and at 38 x 32cm x 7.5cm it should take care of the biggest joints. 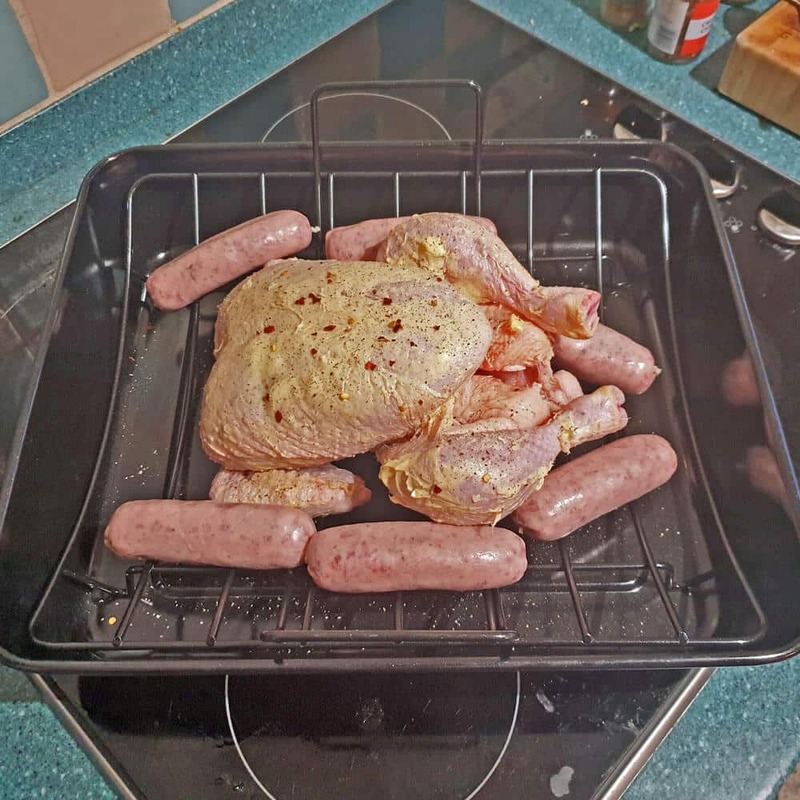 My medium chicken looked rather lost in it, so I threw 6 Pork sausages in there too. The plan is for them to cook in the chicken stock. I don’t normally use a rack when roasting, so I was quite interested to see if it made a difference. 6. Sausages stored ready to go. The oven is on at 170 deg fan, pre-heating. I’ve put my oven rack slightly lower than the centre. I’ve also taken the string off the bird, as I find it cooks more evenly. While the oven is warming up, I quickly made a paste. Soften 25g butter and add chilli powder, a squeeze of lime juice, coriander, salt & pepper. This was smeared all over the skin, and extra chilli flakes added at the very end. 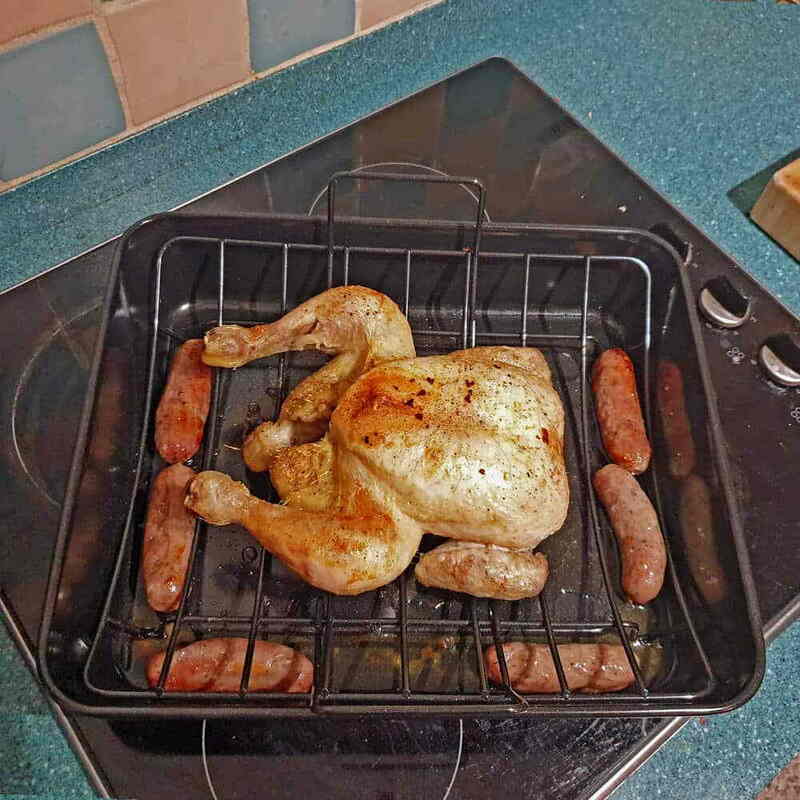 The sausages start cooking with the bird on the rack, to stop them sticking to the bottom of the tray. Place in the oven; rotate the tray after 30 mins and move the sausages to the bottom. By this time, the chicken will have started releasing juices. On the hour mark, remove the sausages as they should be ready. 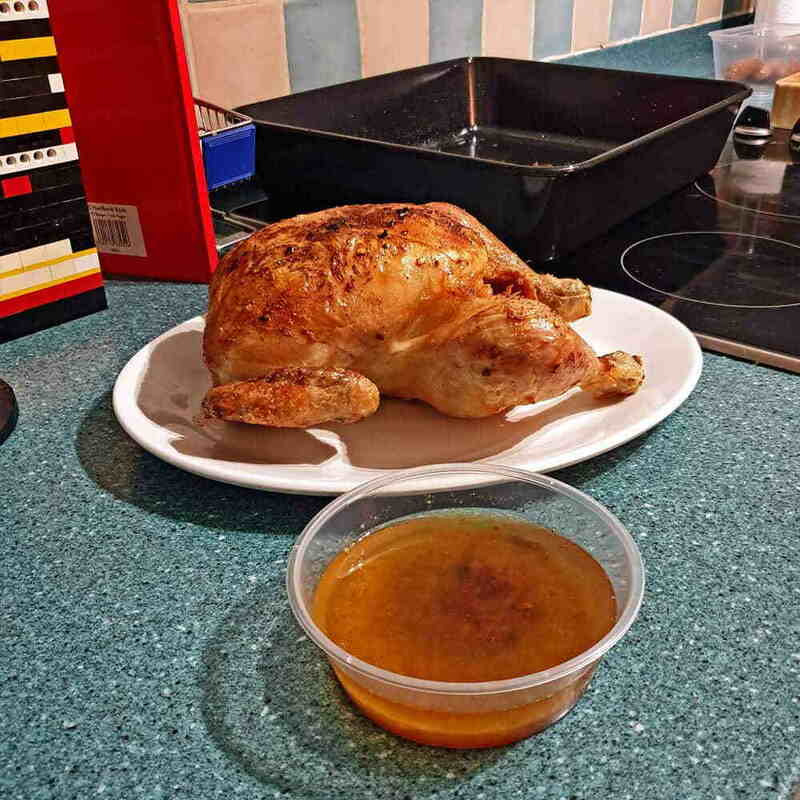 Give the chicken a baste to recycle the flavour, and return to the oven for another 30 mins. Rest the chicken under foil. I’ve drained those lovely juices into a Clear Round Plastic Container as that stuff is nectar from the culinary gods. The fat will separate when it chills, scrape off the top layer to leave lovely pure chicken stock that will happily live in the freezer for months. 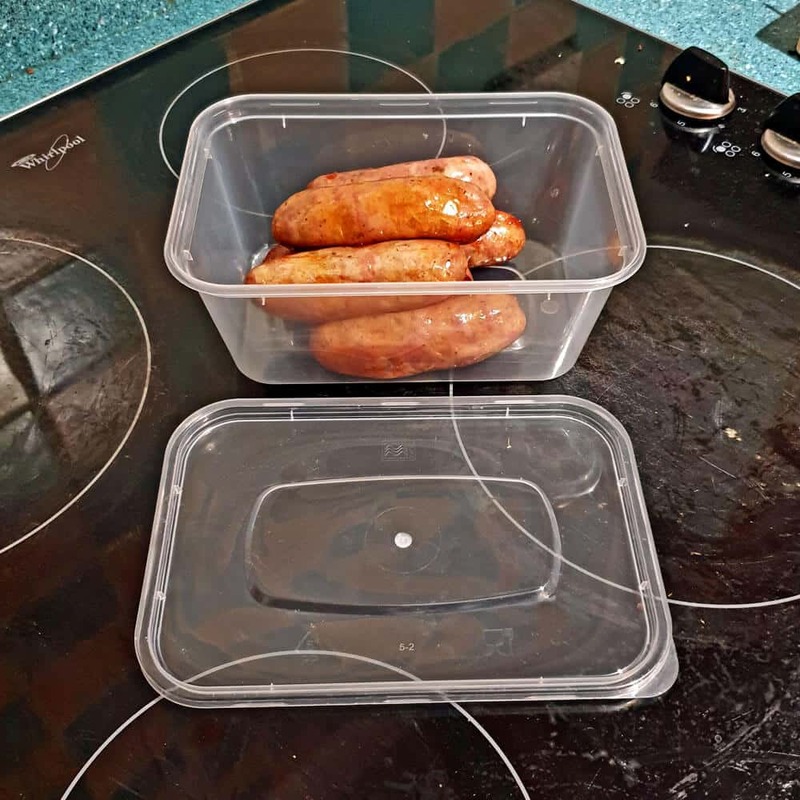 The sausages are now in a Rectangular Plastic Container, ready for that time when only a slightly spiced sausage sarni will do. (all the time in my house) If you need to label the container, we can help with that too. 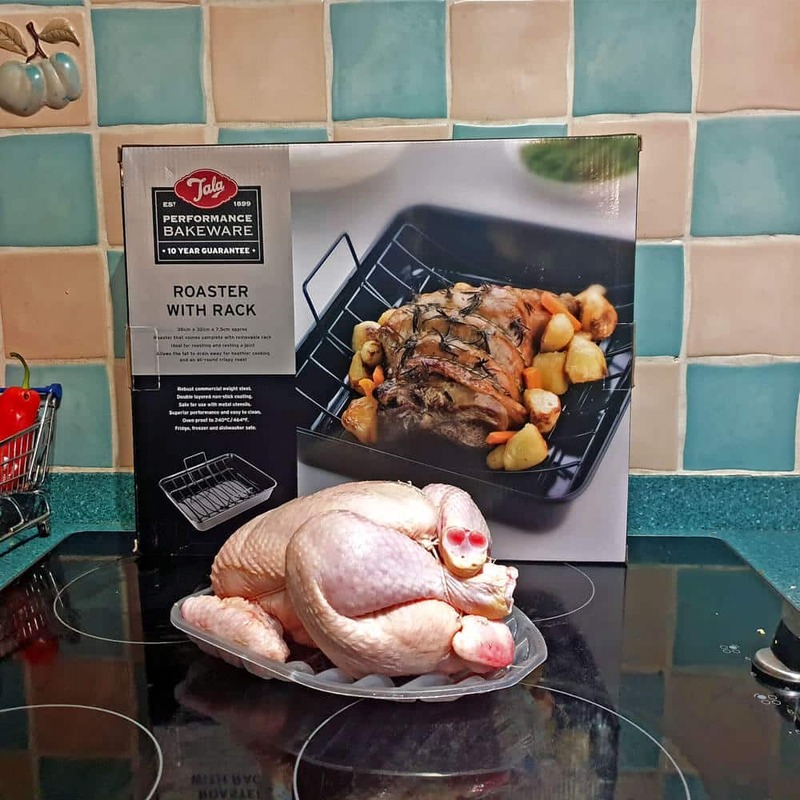 This oven roaster is a lovely bit of kit; the chicken was cooked evenly throughout due to the air circulation. Its non stick, so cleaning up was a breeze and it’s guaranteed for 10 years too.